Each country (sometimes each state) has and is proud of its own vernacular. Of late this pure language sophistication is being adulterated by words ‘borrowed’ from the “English” language, which in itself is a dictionary of words hand picked from various languages around the world over the years. This is owing to the fact that English is supposedly an International Language. Though not understanding English or not being able to speak fluently in English is professionally frowned upon in many parts of the world, it is a known fact that the Common Man is often impressed when addressed to in his native tongue. He is highly satisfied if his queries are solved in a language most familiar to him. It is for these reasons that most call centers do not concede to language as a barrier in the services that they offer. Call centers offer all their usual services in most foreign languages. Call centers employ staffs who are well-versed in three or four languages. Candidates with knowledge in a foreign language have an added advantage over their peers. All these services are offered by call centers in many foreign languages like French, German, Spanish or others. 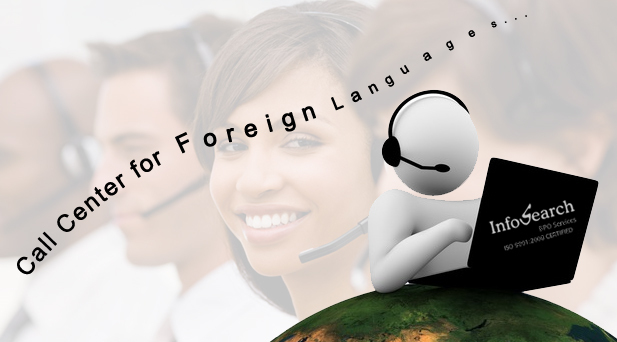 If you wish to discuss more about Call Centers for Foreign Languages, please contact InfoSearch BPO.